Description and Specification High Performance hand-held XRF with Si-Pin Detector. The instrument is small, light and portable, providing on-site and in-situ analysis when-ever, where-ever, and what-ever you decide to analyze. High resolution PDA, coupled with mini multi-channel analyzer via Bluetooth communication, keeps the measurement data in hands under any circumstances. Able to do rapid analysis in handheld mode or long time precise analysis in the test stand provided. Our rugged military inspired design makes the instrument highly resistant to Shock, Moisture and Humididty, dust, High or Low temperature and Altitude changes. Powerful Analysis Software enables the user to quickly identify alloys as well as any elements from Sulfur Through Uranium in PPM amounts. Characterized by high sensitivity, short measurement times, and simple operation this XRF makes a great addition to any business. Whether your performing Rapid identification of alloys or analyzing minerals for a mining operation the automatic qualitative and quantitative analysis operation provides incredible results. All test methods are Free TO ADD. (Unlike other companies) :- Hazardous substance Analysis, Alloy Grade Analysis, Soil, precious metal or Minerals from Sulfur to Uranium in Liquids, Solids or Powders. Performance characteristics This Hand-Held analyzer provides the same performance and reliability as the bench-top spectrometers due to combined use of a low-power integrated mini X-ray tube and large area Be-window Si-Pin detector. Built in intensity correction mode and auto correcting deviation caused by different geometric shapes or uneven structural density makes this software very powerful. Operate up to 4 hours on one charge. Unit comes with Three Batteries. Solar or car charger is optional. Technical specifications - Detector: Si-PIN detector - Excitation source: mini 40kV/50A X-ray tube, Ag anode end window - Detection time: 10-200 S (handheld or seat) - Forms: Solid, liquid, powder - Choose up to 26 elements to be tested simultaneously - Detection limit: 0.01% or 100 ppm - Calibration method Using Pure Ag sample supplied - Safety: Administrator model with password protection, no operators can use it without authorization - Data usage: Edited inside PDA, and stored in PC for saving and printing. 16gb storage card included - Power: Batteries will operate unit for more than 4 hours per charge. Weight: 1.35KG - Ambient operating temperature: -20 deg to 120 deg F.
Standard configuration - PDA/Si-PIN detector/ Amplifier circuit/ x-ray tube and high and low voltage power. Weather proof case - Mineral sample analysis, Alloy, Elemental FP methods installed in software. Optional items are, Lab Test Stand, Solar or Car Charger. Comes with SD memory card, SD card reader. We have developed a general system that usually works to everyone's satisfaction. And we always want Happy Customers... Hires a local rigger at very reasonable prices. Please remember that we sell items in various condition, from brand new and factory sealed to severely damaged and parts only. If your unsure, please ask. We will be happy to help in any way we can... Photo's, statements, forms, etc... We take GREAT care in packaging all of our items... And are always happy to go the extra mile to be sure your product arrives safely.. In the event that a customer wishes to return an item for ANY reason which is not mentioned. We are a business engaged in the sales of technical and industrial equipment, as well as antiques-collectibles and retail surplus... We specialize in offering new and used merchandise for sale at bargain prices. Pleas let us know if we can help you in any way... Thank you for shopping, and have a Wonderful Day... FINANCING & LEASING AVAILABLE JUST ASK. 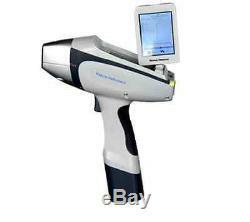 The item "NEW XRF ALLOY analyzer X-Ray Spectrometer Hand-Held metal ELEMENTAL ROHS" is in sale since Tuesday, April 5, 2016. This item is in the category "Business & Industrial\Healthcare, Lab & Dental\Medical & Lab Equipment, Devices\Spectrometers & Spectrophotometers". The seller is "uncledan75" and is located in Antigo, Wisconsin. This item can be shipped worldwide.